I love that quote too! It is so true! I LOVE the Lorax and that quote is my favorite part. I keep thinking I should get that quote for the playroom wall. Agreed! I love that quote! It needs to be plastered everywhere! So true. we all have to make a decision, a choice to do something about problems we encounter. Otherwise nothing happens. I was just reading this to my little guy last night. I love any his books! I love the tongue twisting he pulls off. My kids love that I can read them sing songy. I love that, we haven't seen the movie yet (I know, I'm a little behind) but my kiddos love the book! We love both the book and the movie as well. That's a great quote, I'm excited to see the movie. Great quote! I still need to see the movie! Great quote. We loved the book and movie. 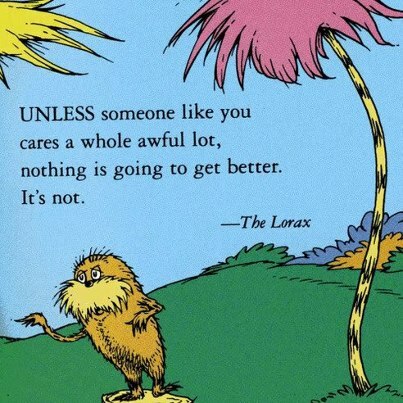 The Lorax knows his stuff. Great quote! I completely agree. As I said on FB that is why I cant keep my mouth shut about autism recovery. Autism is treatable!!! I didn't even think to get the book. I need to go buy it ASAP. Great quote, Dr. Suess was amazing in his ability to make important messages relateable.